Over the last eight years, since the start of the Syrian crisis, the number of displaced persons has risen to a number never before seen. According to the most recent UNHCR data, there are currently 6.5 million persons who have been forcibly displaced, 22.5 million registered refugees, with 5.6 million from Syria alone. Although there has long been engagement by the international community to provide opportunities to access primary and secondary for refugees and displaced persons, access to tertiary education has not been a formal mandate, nor a priority. For refugee and displaced persons, access to tertiary education through regular pathways is virtually non-existent, due to the constraints of language, restrictions on movement either in-country or host country, political and cultural perspectives, lack of funding and information on opportunities, and bureaucratic policies at higher education institutions. In July 2016, with a seed grant from the Open Society Foundations, Dr. Keith David Watenpaugh, Professor and Director of the University of California, Davis Human Rights Studies, brought together a small group of experts from the Harvard Humanitarian Institute and the American Association of Collegiate Registrars and Admissions Officers to brainstorm on how to break down some of the identified barriers to tertiary education, and the concept of the Article 26 Backpack™ emerged. Through support of the Ford Foundation, and in consortium with the American University of Beirut and the American Association of Collegiate Registers and Admissions Officers, the University of California, Davis has further developed the concept and technical platform of the Article 26 Backpack™ (A26BP™). The A26BP™, named for article of the 1948 Universal Declaration of Human Rights, is a unique human rights tool that empowers young people, and supports academic mobility through providing a safe and secure place to store documents, images, and multimedia, with the added ability to share the contents with university admissions officers, potential employers, and when applicable, credential evaluation professionals. All components of the A26BP™ are supported by the underpinning human rights value that the Backpack, and all of its contents, is owned by the Backpacker, and only the Backpacker may choose to share the content. Although there have been numerous projects that utilize technology to support access to higher education for vulnerable populations, the A26BP™ is distinct in that it not only utilizes emerging digital capabilities of document storage and sharing, but it also engages with the user, whom we call ‘Backpackers’, on a human level through the Backpack Guide System, My Story/ My Future and the Compass feature. Through the initial field exercises in Lebanon, November 2017, these components were shown to be of significant value, not only for the Backpackers, but also for the Backpack Guides. In order for the A26BP™ to be fully utilized by these vulnerable populations of young university age persons, it is necessary that a firm trust base between the A26BP™ and the potential Backpacker is established. To this end, the Backpack Guide System and training program was developed and implemented in the field. The Backpack Guide System utilizes the engagement of near-to-peer young people from the host and refugee communities to act as Backpack Guides, who are responsible for educating the potential Backpacker on what the Backpack is, and what it is not. 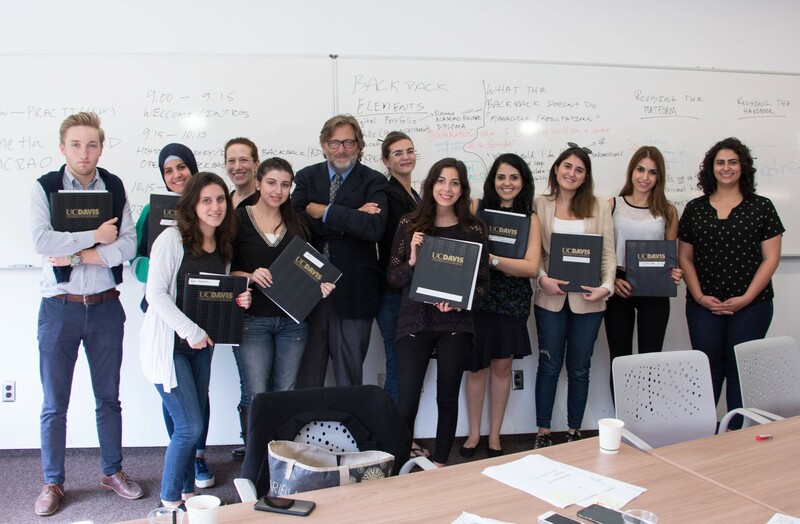 The first cohort of Backpack Guides, recruited primarily through the American University of Beirut School of Education, at both the undergraduate and graduate levels, received training based on the Backpack Guide Handbook. The Backpack Guide Handbook provides the Guide with a brief history of the A26BP™ concept, an outline of how the Backpack works, ethical and safety responsibilities of Guides in the field, and guidance on how to hold a Backpack event. In addition, one of the most important functions of the Backpack Guides is explaining the core rights of the Backpacker through a discussion of the Backpacker’s bill of rights. Our findings from the field exercise exceeded expectations in the area of the Backpack Guide System on multiple levels. First, the implementation of the Backpack Guides is viewed by the American University of Beirut, and other elite institutions in Lebanon, as an opportunity to support civic engagement, good citizenship and public service. Second, the Guide System is a key component in creating the trust base between the Backpack and potential Backpackers. All core Backpack Team members were undeniably impressed with the commitment and dedication of this Cohort of Backpack Guides, and see this as an opportunity for the Guides to further impact their own communities through first-hand experience in working with the refugee population in Lebanon. In the Spring and Fall Exercise, 2018 in Lebanon, teams of Backpack Guides will fan out across the country and help refugees open and fill over 600 Backpacks. A second, unique component of the A26BP™ is the My Story/ My Future feature. My Story/ My Future is a short, visual personal statement of purpose, and is a critical part of the Backpack. My Story/ My Future allows the Backpacker to film and upload themselves talking about their lives, stories, academic and professional accomplishments, and to where they see themselves in the future. This is considered a critical component, as not only does it add a very personal human element to the Backpack, it allows the Backpacker an opportunity to self-reflect on their lives and achievements, and provides safe space to think of future possibilities in settings that do not readily support this type of reflection. 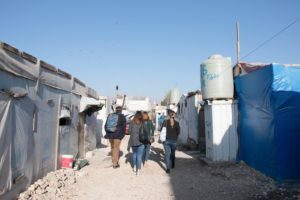 The first My Story/ My Future was recorded by a Backpacker in the Jarahiyya Camp School, located at the edge of a medium-sized informal refugee camp settlement off the Beirut-Damascus highway in the Central Biqa’ Valley. This My Story/ My future recounts the Backpacker’s experience of having one year to complete a degree in Chemistry before being imprisoned and tortured in Syria for the Backpacker’s political beliefs. After four years, the Backpacker was released, but was not able to resume studies at the university previously enrolled. 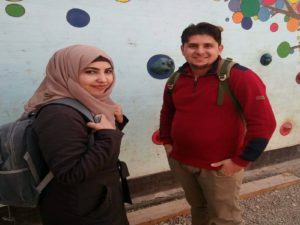 After fleeing to Lebanon, this Backpacker currently teaches refugee children, but hopes to finish the degree and return to Syria—the country of the Backpacker’s home. Our findings from the field exercise for My Story/ My Future showed unequivocally the power that humanizing the conflict has. All core Backpack Team members, and Backpack Guides, were moved beyond tears. One of our Backpack Guides reflected upon return to Beirut that through this experience working with this Backpacker, she now has a completely different opinion of the refugees in Lebanon, and will make it a personal point to challenge popular notions regarding this population within her social and family networks. Through the incorporation of My Story/My Future, the A26BP™ aims to put a face to digital portfolio and documentation, so that any end user will feel an immediate connection to the Backpacker. Though slated for further development in the second phase of the A26BP™ project in Fall 2018, the Compass will play an integral part in expanding opportunities to local NGO (non-governmental organization) services, scholarship resources through partnership with the Institute of International Education PEER (Platform for Education in Emergencies Response), and career and education guidance and counseling. In addition to functionality of the Compass to directly put the Backpacker in touch with those resources mentioned, the Compass will also allow the Backpacker the possibility to have an assessment of their educational documentation completed. This assessment, done by a professional credential evaluator, will be able to be shared by the Backpacker to any institution, in order to assist admissions officers in making an informed decision regarding the stored educational documentation. We look forward to sharing our findings of the functionality of Compass in the Fall of 2018. The Article 26 Backpack™ is a human rights tool that takes digital document storage and sharing capability to the next level through the incorporation of face-to-face counseling and video statement of purpose. All components of the Article 26 Backpack™ are based on the core human rights notion that the Backpacker, and only the Backpacker, owns the information and documentation stored within. In compliance with the University of California, Davis security protocols and EQPR (European Qualification Passport for Refugees), the Backpackers enjoy the same security of information that faculty, students and administrators have at U.C. Davis. The complex intersection of both technology and human elements of the Article 26 Backpack™ make this a truly unique tool to support access to higher education, and empower Backpackers through the creation of their own personal narrative of past achievements, into those of the future. Follow the Article 26 Backpack™ through our next phase of implementation in Lebanon, June 2018, and further developments of the platform. Shereen has been conducting research on educational credentials from precedent and non-precedent source countries and reviewing documents for evaluations for internationally educated physiotherapists for over 6 years. Prior to her experience at CAPR, Shereen worked as an Outreach Liaison Specialist at Job Skills supporting newcomers and immigrants in York Region. Shereen holds an Honours Bachelor of Science degree in Psychology and Communication, Culture and Information Technology from the University of Toronto and a post-graduate certificate in Corporate Communications from Seneca College. Shereen also co-presented at the TAICEP 2016 conference in Chicago on the following topic "Increasing Pre-Arrival Support for Internationally-Educated Professionals in a Culture of Openness and Transparency." She also recently presented at the 2017 conference on education fraud and degree mills, and is currently the Chair of the Marketing and Communications Committee at TAICEP.